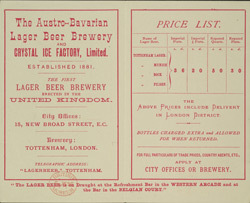 Britain has a long history of brewing lager and one of the first brewers in the country was the Austro Bavarian Lager Beer Company of Tottenham, London. For most of its history, it was staffed entirely with immigrant German-speakers and their English-born families. In 1886 it was renamed the Tottenham Lager Beer Brewery. It closed in 1903.